The sun was up and out after a long winter, casting the most beautiful shadows all over my kitchen table. How could I resist using it to take reference photos? My only regret is I had very little available in my kitchen at them time to use in them. Garlic is one of my favorite flavors, and I love how it looks almost as much. I painted this still life using acrylics on stretched canvas. 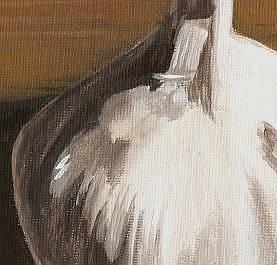 I labored over the gentle, yet exact shadows that were cast by the garlic on the surface of the table. Building up the table texture, I began to concentrate on the highlights. I love dramatic light in a still life, because it makes the light as much a subject as the objects being painted. 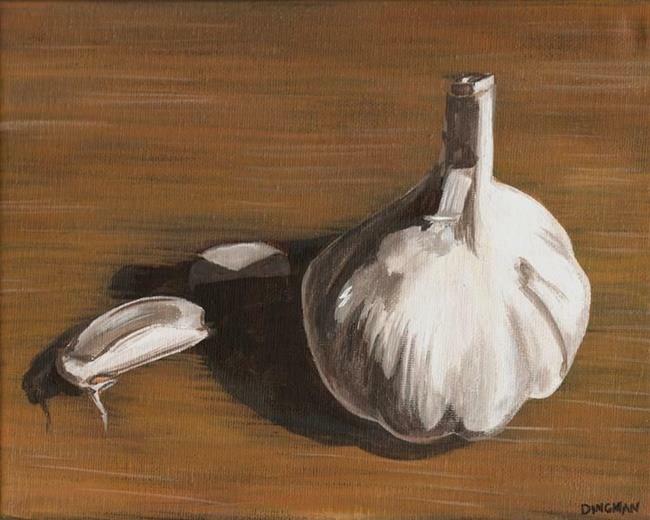 My favorite part of this piece is the way I was able to capture the matte paper texture of the garlic cloves.